Getting kids involved in Thanksgiving is a great way to help them understand what the season is all about and create some memories along the way. Thanksgiving is full of a lot of great traditions—but how many of them are easy for little ones to understand? Getting kids involved in Thanksgiving is a great way to help them understand what the season is all about—and create some memories along the way. Here are six kid-friendly traditions you should try this year. 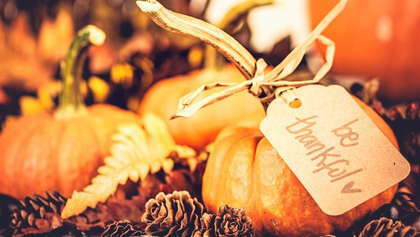 Go beyond just naming the things everyone in the family is thankful for, write them down and put them on display. Seeing these things every day during the season will help remind everyone what Thanksgiving is for. Combine them into a fall wreath, like this craft from Parents. Or, instead of adding paper thankful leaves to a wreath, have the little ones pick up sticks from the yard, add them to a vase and attach the leaves for a creative centerpiece. Older kids can write what they're thankful for on strips of paper and turn them into a cute pumpkin, like this craft shared by The Moffit Girls. Not real crafty? Just pick up a chalkboard and add something new each family member is thankful for every day. It's often hard for kids to be thankful if they don't realize how much they really have. Teach older kids how fortunate they really are by spending some time volunteering at a charity in your area like a soup kitchen. Even younger kids can help out too—pack up a box of toys they don't play with anymore and donate them, involving them in the process and sharing the idea that there are kids who don't have any toys to play with. The pilgrims started Thanksgiving after exploring something new—why not do the same every year with your kids? Check out a museum, park or zoo you haven't been to before. Take the little ones out to try something they've never done before like ice skating, rollerblading or playing laser tag. Try a new local restaurant. Explore a nature preserve. The possibilities are endless—and you can try something different every year. Face it—a lot of Thanksgiving tradition happens in the kitchen, where kids often get shooed out before they get in the way. But getting the little ones involved is a good way to create Thanksgiving memories. Older kids can help out by decorating cookies or assisting in a favorite dish. Tots too little for cooking can still get involved—have them color place mats to decorate the table. Reminisce every year by creating a project that shows how your family has grown over the years. Add the kids handprints to a table cloth or table runner every year. You can also add what they're thankful for that year. Bring it out for your Thanksgiving feast every year to adorn the table. The fall is a great time for new family photos with the leaves making an excellent backdrop. Celebrate coming together as a family for the holidays by getting a new family photo session every year. If you get them taken a bit before the holiday, you can share the prints with extended family as everyone gets together. The holiday season is packed full of traditions, but a lot of them don't quite make sense to little kids. But by getting each family member involved in the holiday, it's much easier to create memories that will last for years. What's your favorite family tradition for the season? Share it with our readers in the comments!